Things are looking better overall for the residential real estate market in Tallahassee. Our listing team closed on the most expensive home sale in Tallahassee in more than 10 years (more to follow on that one in the next blog post), while unit sales of all homes sold in April were higher than what was recorded in April of last year. This year over year gain is more evidence of a strengthening housing market in Tallahassee. Today's report provides a window in to different home sales by type, whether condominiums, townhouses, or single family detached homes. We also review the differences between arms length home sales and distressed home sales. Were it not for the past 8 years of short sales and foreclosures dominating the Tallahassee real estate market, we would be shocked to report that more than 1 in every 4 homes sold has been a distressed property. 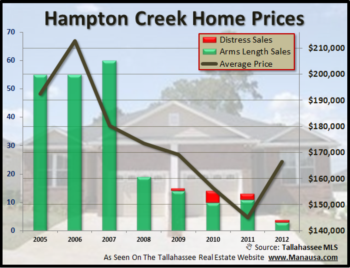 However, this ends up being "good" news, as Tallahassee has just hit a four-year low in the ratio of distressed home sales to arms length home sales. In the graph above, the green bars measure the total number of arms length homes sold, while the red bars measure the number of distressed homes sold. The ratio of distressed homes sold in the overall market is shown as a red line and recorded on the right vertical axis. Through April, 28% of the homes sold were distressed ... short sales, foreclosures, or bank owned properties. Thus far in 2015, the average house price is on the rise. There is a big difference between the price of the average distressed home ($117,500) and the price of the average arms length home ($227,500). This is not a valid "apples to apples" comparison, as the average arms length home is 21% larger than the average distressed home (meaning that they are not the same types of home, on average). This next graph shows that values are on the rise for arms length home sellers, while the opposite is true for those selling distressed homes. Much of this has to do with the evolution of the distressed market, where short sales are going away, leaving the market to properties that have been in the market longer due to a lengthened foreclosure process. Many of these homes are in very poor shape, so the discount shown above (40%) is most often due to declining conditions among the distressed properties. Just as in years past, homebuyers are favoring single family detached homes over condominiums and townhouses. Through April, 80% of all homes sold in Tallahassee have been single family detached. Not only do buyers favor single family detached homes right now, they are willing to spend quite a bit more for them. In the graph below, the average price of each property type is shown. Currently, buyers are spending 120% more for a single family detached home than they are for "attached" housing, and I believe this ratio will begin to decline when mortgage interest rates eventually rise. The smaller condos and townhouses will return to favor when they become the only affordable option for many buyers. Mixed Return On Appreciation For Sellers? At first blush below you might think that townhouse and single family detached homes are appreciating, while condominiums are depreciating. That is not really the case. With so few sales in the condo market, we see a lot of "noise in the data" or fluctuations among condominium prices and values due to the downtown market. The expensive condos downtown have a big impact on averages when they sell. Prior to the housing market bubble, we really did not have "expensive" condos in Tallahassee. We only had less expensive ones and most were student housing for the colleges. But as our downtown market has begun, the scattering of sales (or lack thereof) for periods of time makes the average numbers bounce around a lot. If you'd like to know what your home is worth, we offer a FREE evaluation that is far more accurate than the online valuation tools. Simply drop me a note and I'll have our valuation specialist reach out to you promptly!